"New screen fitted perfect, delivered on time, happy customer." *Grey/Smoked Screens normally available from stock. Clear and black manufactured to order, with approx. 7-10 working days delivery (non-refundable payment taken at time of order for all specially ordered screens). 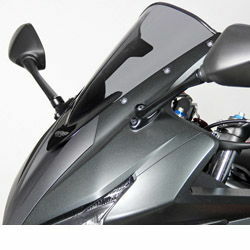 !quote, 63049, windshields, wind, shields, motorcycle, vision, doublebubble, screens, dubble, gray, tinted, cbr, 500, 500r, 16, 17, 18, 19, 20, 2016, 2017, 2018, 2019, 2020!